The Coordinate Measuring Machine measures the geometry of objects using a probe. Its supports are traditionally manufactured using CNC machining. Multiple iterations are required as the measured object changes during the design process. All iterations can be produced with HP Multi Jet Fusion technology, using HP 3D High Reusability PA 12 Glass Beads material,1 which provides the stiffness and dimensional stability needed for accurate measurements. HP Multi Jet Fusion technology helped optimize time and cost in the production of this manufacturing aid. 1 HP Jet Fusion 3D printing solutions using HP 3D High Reusability PA 12 Glass Beads provide 70% post-production surplus powder reusability, producing functional parts batch after batch. For testing, material is aged in real printing conditions and powder is tracked by generations (worst case for recyclability). 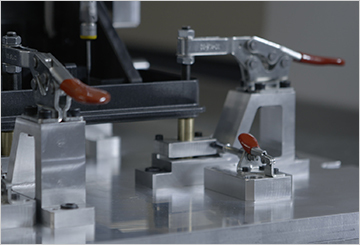 Parts are then made from each generation and tested for mechanical properties and accuracy.